There's never been a lot of demand for a compact, supermini-like vehicle boasting permanent all-wheel drive. 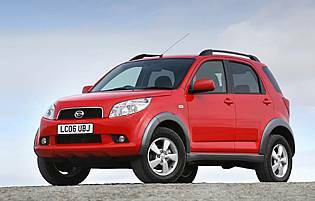 That hasn't stopped Daihatsu from persisting with the format, which is why we have the Terios. Outside its native Japan, the Terios is something of an oddity. But the combination of Honda-like levels of durability, supermini dimensions and all-weather adaptability is an intriguing combination for some buyers. If you're considering a Terios, there's a real chance it's because there's nothing else available with the little Daihatsu's combination of attributes. It's true that small, rugged yet refined off-roaders are a scarce commodity. And it's a fact that Daihatsu knows all too well. In Daihatsu's homeland, slightly left field cars flourish, if only because you've got to produce something to stand out in a market close to saturation point. Elsewhere it's a slightly different matter: such an odd combination of features as present in the Terios tend to have consumers scratching their heads. The more enlightened ones, however, know the car's real worth. Originally a genuine oddity thanks to its tall, slim upright cabin, this Terios has grown slightly in size – as have so many conventional supermini models. Unlike regular family runabouts, the Terios doesn't feel or look bloated. In fact, it's actually made the car more of a mainstream proposition. True, it will never compete with the likes of Ford's Fiesta or Fusion, but this Terios now makes more sense. It can cope with a growing family and their clobber, and it feels more stable on the road at all speeds. It's also more European in its cabin design and rivals many European offerings in the build quality department. And then there's its permanent four-wheel drive system and off-roader stance, attributes that make it something of an all-weather winner. No longer the oddball mini 4x4 it once was, the Terios is now a car that happily combines its off-roading capabilities with the ability to play supermini and motorway mile muncher when asked. Cabin ambience and build quality have taken significant leaps forward, and the car's bigger dimensions make it more practical. If only the engine was a little more powerful. As it it's adequate, and illustrates Daihatsu's modest corporate personality, which is a shame because the rest of the car is so good. With a modest asking price and the prospect of years of trouble-free motoring, the Terios won't break the bank to own and run. Fuel economy won't exactly drain your bank account dry either, but thanks to four-wheel drive it won't be able to match a conventional supermini. Overall, for what the Terios offers, it will be difficult to find something similar for the same money, which puts the car in a near-unique position and should help future resale values. Having grown in size over its predecessor, this Terios boasts enough cabin space for a growing family. It's also got a pretty decent-sized boot plus the ability to fold the rear seats down and swallow larger items. Cabin oddment space isn't brilliant, but it is acceptable. At least the cabin is now wide enough to accommodate two adults in reasonable comfort – unlike the old car. The Terios is a simple vehicle, and this is reflected in its controls and displays. The main dials are large and easy to read, while the major controls located high up on the fascia are intuitive. 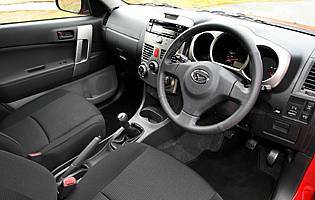 The minor controls down to the right of the driver are less easy to see, but overall Daihatsu has done a good job. The radio is a little fiddly though, and there are no remote audio controls on the steering wheel. 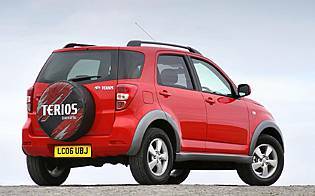 For a relatively short car with a higher than average centre of gravity, the Terios rides and handles well. Pitch and yaw is kept to a minimum, while the same is true of road and wind noise at modest speeds. Alas, the engine can sound stressed when pushed hard, and wind noise is obvious at motorway speeds. The car's seats are supportive and comfortable, though, and two adults can sit together without clashing elbows. You get remote central locking with the Terios plus an immobiliser package, which is all you really need on a car like this. More important will be the need to keep valuable out of sight, and possibly purchase a visible deterrent such as steering lock to put off the casual car thief. Twin front and side airbags are standard on the Terios, which brings it into line with other cars in the conventional supermini class. AS you would also expect, anti-lock brakes are also standard, along with electronic brake-force distribution (EBD) to help boost braking power in an emergency. You can also count four-wheel drive and a centre locking diff, which should help boost grip levels when you get into seriously sticky situations. Assessing the Terios in its native environment, it copes well with urban road imperfections and changes direction quickly and safely. The car's lofty driving position is a bonus around town, while the steering and manual gearshift require little effort to operate. The sole engine option – a 1.5-litre petrol unit – is an acceptable one, but can become noisy and sound strained when pushed hard on long motorway inclines and under hard acceleration. Off road the Terios is more than capable of dealing with muddy fields, shallow water hazards and rocky paths – you can even lock the centre differential for increased traction. While not specifically being targeted at families, the Terios is versatile enough to accommodate a growing family. It can't compete with conventional people carriers, but there's enough cabin and boot space for shopping, a pushchair or leisure equipment. Another plus point is the durable nature of the cabin; the fabrics and a plastics used might not be glamorous by they do look hardwearing. The Terios isn't an expensive car to buy and certainly won't cost a lot to run. All-round visibility is good, and its four-wheel drive feature makes it a great all-weather mode of transport for a novice driver. For those in the know, Daihatsu represents durability and reliability. These features have over the years helped bolster what is a surprisingly loyal customer base. 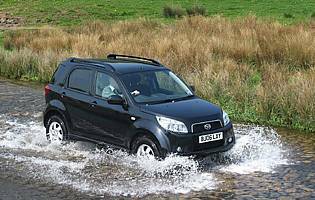 However, what Daihatsu's various models boast in terms of reliability they've previously lagged behind in the cabin quality stakes. The introduction of recent new models has seen a welcome improvement in the types of cabin plastics and fabrics used. Like Ford's Fusion, the Terios boasts a higher than average ride height – although not too high so as to make access and egress difficult. On the contrary, even those less agile should find it easy to slide into – not slump down – the cabin. Equally welcome are doors that open wide and plenty of headroom. Don't expect a flashy audio unit in the Terios because, despite the otherwise generous levels of standard equipment, the car makes do with an average radio and CD player. Don't be mistaken; it does a fine job, but that's about it. At least it's mounted high up in the fascia, which means it's easy to operate when on you're on the move. Bold, bright colours suit what is a bold, bright-looking car. Its jaunty looks lend itself well to reds and blues. Inside it's not so bright, with black and grey dominating the cabin. That said, the materials used are durable, which is important in a car designed with off-roading in mind. Despite growing in size over its predecessor, the Terios is still a small car by modern standards. Such an attribute proves its worth when parking, combining with the lofty driving position and good all-round vision to make parking easy. Helping matters is the light steering, easy to modulate clutch and the unusual inclusion of rear parking sensors as standard. Spare wheel is affixed to the outside of the car's rear door. One engine option – 1.5-litre (105bhp) petrol. Five-speed manual gearbox is standard, four-speed auto an option. Trim levels: S, SX, SE Automatic.